D&D Leasing has announced a major rebrand to DND Finance to reflect its growing range of services. The announcement was made at its annual black-tie charity event, which was this year raising funds for Grief Encounter, a non-profit which supports children through the bereavement process. 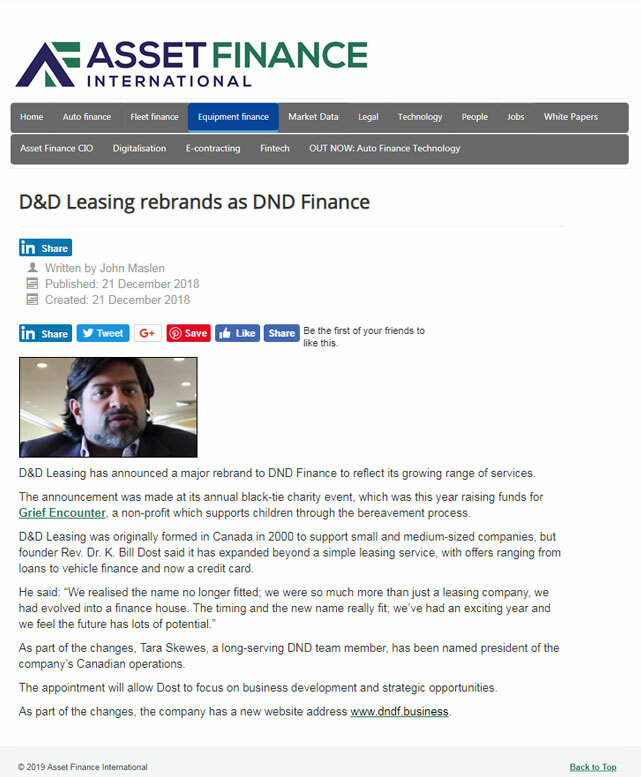 D&D Leasing was originally formed in Canada in 2000 to support small and medium-sized companies, but founder Rev. Dr. K. Bill Dost said it has expanded beyond a simple leasing service, with offers ranging from loans to vehicle finance and now a credit card. As part of the changes, Tara Skewes, a long-serving DND team member, has been named president of the company’s Canadian operations. The appointment will allow Dost to focus on business development and strategic opportunities. As part of the changes, the company has a new website address www.dndf.business.